The words perfect and prefect look similar and can be easily confused. In this Grammar.com article, let us understand the difference between both words with examples and then do some exercises to make sure we have understood the difference. Perfect (adjective) means something that is flawless or complete. · No one is perfect in this world. · Draw a perfect circle and show it to the class. · He is the perfect example of how a boss should be. · This statement of purpose is perfect. It contains all the necessary details. · The map is scaled to perfection. · She works hard to perfect her handwriting. · You should work on perfecting your strikes to play in the finals. · She perfected his stitching skills before the exam. · He placed the ball perfectly inside the hole. The noun of perfect is perfectness. Example – The perfectness of his deeds sometimes scares me! · I have been working at the hospital for 4 years now. · I have completed the assignment. Note, that the tense is called ‘perfect’, but there is no usage of the word ‘perfect’. Words like have, has and had are used for indicating perfect tense. Picture-perfect – something that is without any defect in its appearance or character. A photo, a place, anything that you see or perceive as flawless can be categorised as picture perfect. · We have planned our honeymoon in Switzerland. The place is picture-perfect. · He surprised me with a ring on our wedding day. It was a picture-perfect moment! Inch-perfect – something that’s highly accurate, like a measurement, or well judged or placed. · His shots were inch-perfect and the judges were impressed with his performance. · The chip has to be inch-perfect, or it won’t fit inside the phone. Pitch-perfect – the right tone or mood. · The translation was pitch-perfect and we could enjoy the whole movie! · Her voice had the perfect pitch. · In a perfect world, I would be sun-bathing in the beaches of Goa. · In a perfect world, my kids would listen to me without me screaming at them! · Our college has a prefect for every department. · He was a prefect in college and is fit for the position of chief police officer. · As per the prefect’s orders, we need to stop talking now. 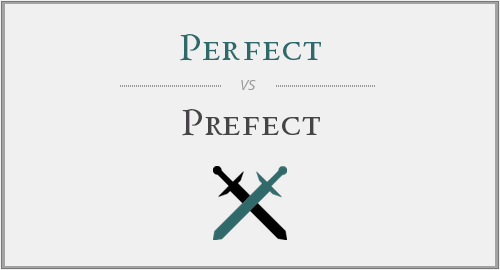 As we see, these two words, perfect and prefect have nothing in common except similar spellings. Here is an example with both so that the words and their spellings are etched in your mind forever. 1. He is a very strict _____. 2. A _______ person does not exist. 3. All the ______ will be given special training tomorrow. 4. _____________ is the key to success. "Perfect vs. Prefect." Grammar.com. STANDS4 LLC, 2019. Web. 22 Apr. 2019. <https://www.grammar.com/perfect_vs_prefect>.